Sculpted biomorphic tripod table base (a) of walnut with metal glides supporting colorless circular glass tabletop (b). 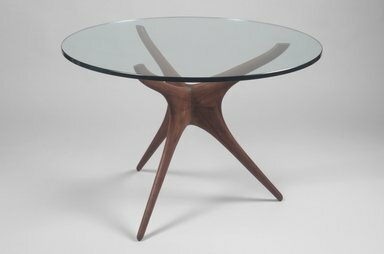 Solid tripod table base shaped like three boomerangs standing on end and joined at center curve; top end of this boomerang sculpted flat to support table top and bottom end rounded to form feet. Tabletop has slightly beveled edges. CONDITION - Very good; crack in underside of joiner, residue of glue on underside.